1. Nyx is not your generic protagonist. I was both caught off guard and interested in Nyx’s character. She was so different from any other protagonist I had ever read. She was mean, and hateful, and full of bitterness. That alone is opposite of the original tale (or at least what I remember of it). I remember her originally being innocent, kind, gracious, and angelic in action (or maybe that’s my Disney side talking); here, she is the exact opposite and has every intention of killing him. Even Ignifex’s character was similar. He was snide, mocking, and embittered. They both had such dark personalities that I found the fit each other even better than what I remember of the tale. I found this retelling fresh and welcoming. 2. The line is fuzzy between truth and lies. One of the themes in this books is truth and lies. Truth is conveyed as hurtful, and so many lies are told in order to keep from hurting people. In relation, lies are presented as blissful ignorance. The more lies they are surrounded with, the less troubles they will have to deal with. At one point Nyx and Ignifex take advantage of this and lose themselves in happiness even though they know it is but a lie. This is a hard theme to tackle, and I won’t lie, it got confusing at times, but it was nonetheless interesting. This is one of the most original adaptations I have ever read. Earlier last week, I had reviewed an adaptation (Queen of Hearts: The Crown by Colleen Oakes), that in my opinion, was just badly written fan fiction. This was a retelling, but it held very little semblance to the original tale, which made it beautiful and completely Hodge’s. Instead of using characters from the original tale and adapting them to fit her story (like Oakes had), Hodge created wonderful characters to fit her story and didn’t worry about how they would fit into the original tale. Even further, I love that this retelling was so immersed in Greco-Roman mythology. My English major heart ate this stuff up! I recognized names, deities, and myths that made this story more lively. It was something I welcomed and thought that it brought a wonderful dimension to Hodge’s creative world. Overall, I believe this was very much a debut novel. It had its issues and was partial to its intricately confusing parts, such as the magical qualities present in this world, but it was nonetheless a beautiful retelling of flawed characters falling in love. 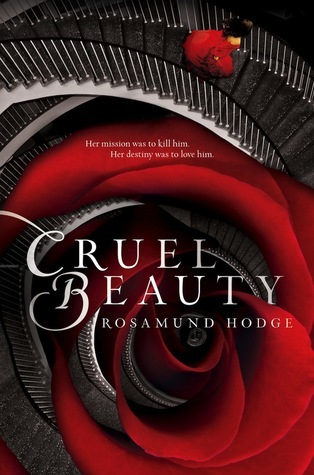 Anyone who has the slightest affection for Beauty and the Beast or paranormal books, would like this one. But beware, this book is not for everyone. Upon opening the cover, you need to be open to differences and a magical realm that is nothing like you’ve ever read before. I gave this book 4 (3.5 really) on my Goodreads.